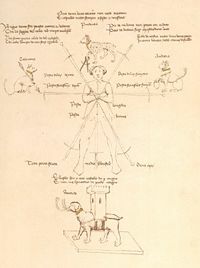 Fiore dei Liberi is a Northern Italian Fencing master best known for his treatise the Flos Dellatorum (aka Fior di Battaglia), the earliest extant historical Italian Martial Arts treatise currently known. In his manuscript Liberi states that he was born in the Diocese of the Patriarchate of Aquileia del Fruili an historical state in Northern Italy, then Austria. The date of his birth has been estimated as around 1350. He was the son of Sir Benedetto dei Liberi. According to his own account, Fiore began studying martial arts at a young age. Building on his natural inclinations to the art, he traveled extensively, studying with Italian and German masters. He mentioned studying under Master Giovanni called Suveno, a scholar of Nicolo from Metz. Fiore was a contemporary of Johannes Liechtenaur, the founder of the German school of swordsmanship. He mentioned in his prologue that he had to fight for his honour several times alone, without friends, trusting only to God and himself and his sword. He began writing Flos Duellatorum on February 10, 1409. Liberi dedicated the book to his commissioner Sir Nicolò III d'Este, Marquis of Ferrara, Modena and Parma, Italy. He noted in the prologue of his book that he had studied the arts of combat for more than 40 years. Therefore, assuming he began training at a young age of 10 years old, he had to have been born around 1350. His death date is an estimate as there are no known records of his life after he published his book. His teachings heavily influenced all of the Italian masters who came after him, most notably Filippo Vadi. This page was last modified on 18 December 2008, at 17:20.